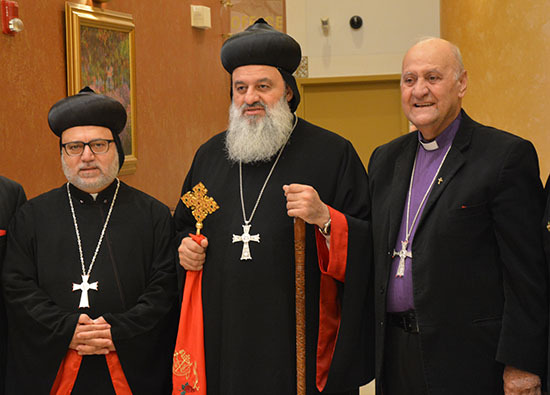 (Photo, Top) His Holiness Ignatius Aphrem II, Patriarch of Antioch and All the East, Supreme Head of the Universal Syriac Orthodox Church at the Retirement Banquet of Very Rev. Fr. Edward Hanna (right of HH) of Sts. Peter and Paul's Syriac Orthodox Church, Southfield, Michigan on October 6, 2017. On the left of His Holiness is His Eminence Archbishop Mor Dionysius John Kawak, Patriarchal Vicar for the Archdiocese of the Eastern United States. (Photo, Bottom) Very Rev. Fr. Edward Hanna, Retiring Vicar of Sts. 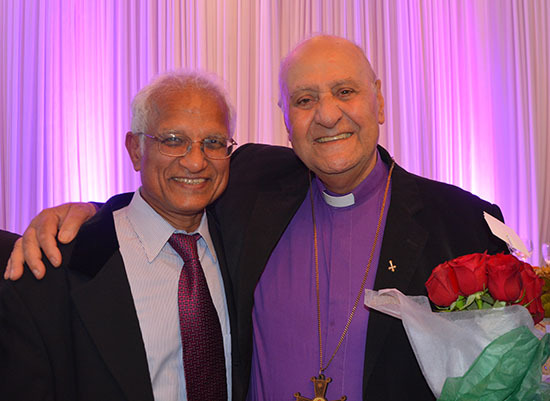 Peter and Paul Syriac Orthodox Church, Southfield, MI with Dr. Jacob Mathew, Chief Editor of Malankara World, at Fr. Hanna's Retirement Banquet on October 6, 2017. During the program, His Holiness described Father Hanna as a true shepherd of those entrusted to his care by the Holy Church. He served them unconditionally even when he was down with cancer. Fr. Hanna is the best example of what Jesus Christ described as a servant leader. Even when he was suffering from chronic pain from cancer, Fr. Hanna went to hospital, not for his own treatment, but to see, comfort, and pray for others who are being cared for at the hospital. It was difficult to miss the affection and love of our Holy Father to Fr. Hanna. A sold out crowd at the banquet hall attended by people from all over the United States and beyond provided further proof that Fr. Hanna's popularity was not confined to national boundaries.